Winter water temperatures of Northwest rivers can fluctuate between 36 and 39 degrees Fahrenheit—or incredibly cold. Matthew DeLorme casts into the frigid waters of the Sauk River. For us in the World Cup press corps, winter is a venerated time. Summers usually consist of grinding 12- to 16-hour days and they take their toll. Don’t get me wrong, we are lucky to witness the moments we capture on our cameras as intimately as we do. As far as a job goes, hanging out with your mates all day in the dirt cracking jokes and shooting photos is pretty damn great. But when the season ends and I’ve come home and my roller bag is unpacked for the last time, I need to switch gears. I find solace and rejuvenation on the rivers of northern Washington, fishing for steelhead. Swinging flies, or spey casting, is about as close to meditation as I can get. 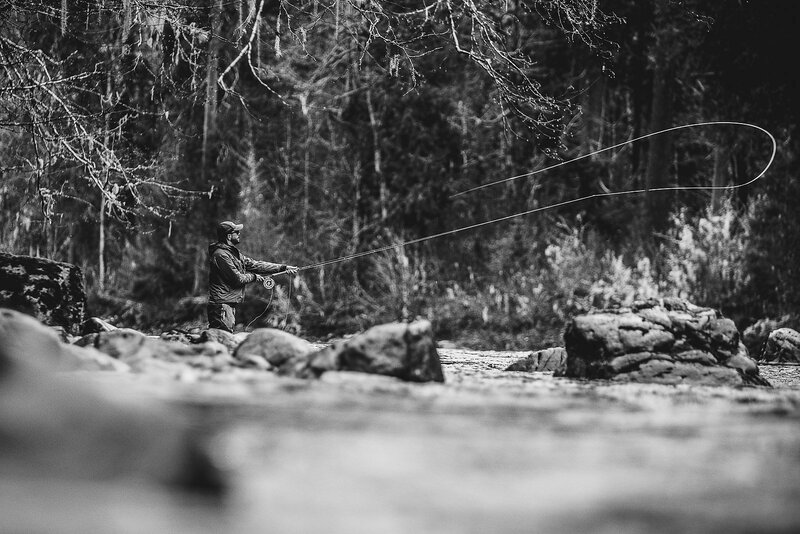 The pursuit of winter-run steelhead on the fly is almost a religion in and of itself. Anadromous fish don’t eat when they return to the rivers, so getting them to bite is pure luck. If you put something in their environment that aggravates them or makes them curious, you may just have a stroke of good fortune. Typically the weather conditions aren’t really comfortable. It’s best with cloud cover and a light drizzle. But around here, rain tends to be a bit more heavy. Ultimately, wearing every layer you have, spending the day in frigid, waist-deep water, in search of a fish that may very well not be anywhere around seems a bit of a folly. But there you are, thoughts allowed to come and go on the currents that swirl past your legs. Cast, mend, swing, repeat. Catching fish isn’t always part of fishing, but that’s what keeps the river so alluring. Matthew DeLorme keeps his loops tight on the Sauk. Your hopes are renewed with each cast. At the head of each run, perhaps somewhere in those currents, could be a unicorn ready to viciously grab your fly and take you for a ride. On the rare instance that you do hook up, it is utterly thrilling. You hope nothing will go wrong, that the wild, angry fish on the end of your line may come to hand, that you get the privilege to interact with these seemingly mythical beasts. Most of the time though, it’s just you, the river and the mountains, all shrouded in clouds. An occasional pull from the whiskey flask helps to warm your insides. It is a pursuit that is truly about the experience. The cast itself is a bit like a ballet, with three parts; with the line tensioned on the water, the rod is swung around and back, leaving a rooster tail of water, before being driven forward to send the cast across the river. When done correctly, it delivers a similar satisfaction to drifting a loamy turn or skipping over a carpet of roots on a steep, slippery track. There’s something so satisfying about sending a streamer 70 feet across a river. I can’t say I draw that many correlations between biking and fly fishing, as they serve two different purposes. One is raw adrenaline, where the world speeds past and, if it goes wrong, it may hurt badly. The other, the world is absorbed slowly, and the adrenaline rush comes rarely. Maybe that’s why I’m so enthralled by both. By having an activity other than riding, I can come back each season fresh, and hopefully with renewed appreciation. Standing in the river, my creativity and clarity is restored by the gentle currents that swirl past, and I walk away from each day on the water with no regrets. The experience of being that connected to the natural world keeps me centered.